The Seaweed Bath Company’s Ocean Fresh Whole Seaweed Bath is specifically designed to help improve the condition of irritated skin, especially for sufferers of psoriasis and eczema, without prescription medications or harsh chemicals. It’s made with 100% natural ingredients – Paraben, Dye and SLS free and is not tested on animals. The product contains all-natural whole seaweed from the North Atlantic surrounding Ireland and Nova Scotia. The seaweed elements alkalize the skin’s pH levels helping to reduce redness, while soothing rough and scaling patches. It’s also proudly made in the USA. 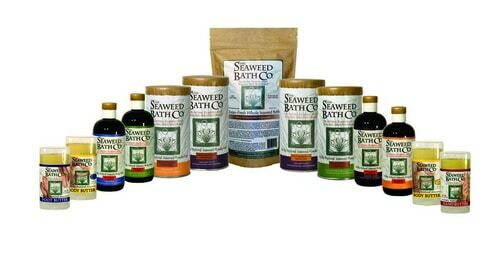 Available at health food and natural drug stores in the US and online at www.SeaweedBathCo.com. One (1) lucky winner will win 3 bottles of the Seaweed Bath! Tweet this message: “I entered the @SeaweedBathCo Ocean Fresh Whole Seaweed Bath giveaway from ladyandtheblog.com (@verasweeney). RT to Enter #contest #giveaway”. Become a fan of LAB’s Facebook Page. Then leave a comment on the wall saying why you love the Ocean Fresh Whole Seaweed Bath giveaway. Fan Seaweed Bath Co. on Facebook and mention that you entered the Ocean Fresh Whole Seaweed Bath giveaway from ladyandtheblog.com. I hope this is open to Canada ?? I’m a facebook fan (ChristineFidance) and I posted on your wall. I fanned Seaweed Bath Co. on facebook (ChristineFidance) and posted about this giveaway. I sent out a tweet! I’m done with your contest entry form! I like your Facebook page, and I’ve posted on your wall the reason why I love this giveaway. I like Seaweed Bath Co on Facebook and I told that I’ve entered this giveaway. I left my email in the entry form. Congrats! You are the winner! Please send your name and address to [email protected]! Thanks. Left my email / completed survey. I Follow Lady and the Blog on Networked Blogs.com. I left my email address on your contest entry form. Great atrlice, thank you again for writing.